Electoral Commissioner Patilias Gamato has stated that people should not be confused with the 2017 election ballot papers with candidate posters. "Candidate photographs are not placed on the ballot papers and are different from candidate posters." "Candidate posters will contain candidate photographs and code numbers which will be allocated after the order of draw when nominations close on April 27, 2017," Mr Gamato said. He said candidate posters will be clearly marked as Provincial Electorate and Open Electorate with candidate photos and their code numbers from 10 up. For example; a candidate that is drawn first after the close of nominations on April 27 will be allocated code # 10, candidate drawn second will be allocated code # 11, etc, etc until all candidates are drawn. "Those candidate code numbers are then placed alongside with candidate photos and candidate posters for the Provincial and Open Seats are generated and printed for use during polling." Mr Gamato said candidate code numbers are also given to them for them to produce their own campaign posters which they will use to conduct their campaign activities. He said the 2017 ballot papers are more secure than the 2007 and 2012 generic ballot papers with fifteen security features – eight security features hidden inside a hologram on the top of each ballot paper and seven security features hidden on the face of each ballot paper. Mr Gamato said ballot papers for the provincial seats are blue while, the ballot papers for the open seats are yellow. A voter will be issued with two ballot papers like in the 2007 and 2012 national elections. He said candidate posters are produced separately from candidate photographs submitted along with candidate bio-data form (Form 29). He added that candidate posters are normally displayed at polling stations and inside voting compartments to assist voters see their preferred candidates and their code numbers to correctly mark their three preferences on the ballot papers by writing the name, code number or both. 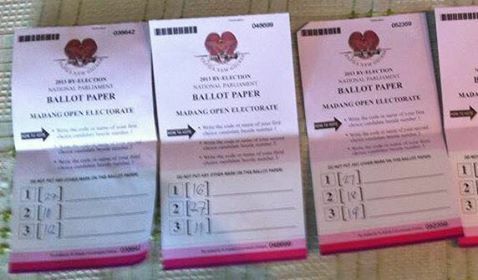 Regarding the security of ballot papers, Mr Gamato said ballot papers are the democratic rights of voters and must be protected at all costs by the PNG Electoral Commission. He said ballot papers are securely locked away in eleven containers at an undisclosed locations around Port Moresby, after arriving from Indonesia last week.